At least one seventh of the world’s population, living in 149 countries and territories, are affected by Neglected Tropical Diseases (NTDs), including roughly 800 million children. In Pakistan, the 2010 and 2011 outbreaks of Dengue – declared by WHO in January 2013 as the world’s ‘fastest-spreading NTD’ – were a stark illustration of the challenges which persist in this realm of global health.Traditionally, NTDs exist exclusively in the poorest and most marginalized communities, receiving little attention from the international health community, despite the fact that they are the most common infections among the world’s poorest. However, this changed last year when a large group of partners in the NTD community, comprising politicians, donors, heads of global health organizations, and pharmaceutical industry leaders came together to commit to the ‘elimination or control of 10 NTDs by the end of the decade’. 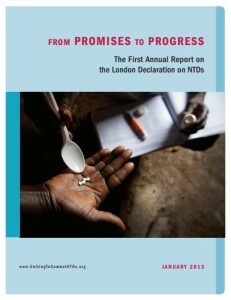 Inspired by the WHO’s 2020 Roadmap on NTDs and in line with its targets, the London Declaration on Neglected Tropical Diseases was launched on 30th January 2012. The NTDs being targeted by the Declaration are lymphatic filariasis, trachoma, soil transmitted helminthiasis, onchocerciasis, schistosomiasis, leprosy, guinea worm, visceral leishmaniasis, chagas disease and human African trypanosomiasis. The London Declaration’s overall aim of improving the lives of 1.4 billion people worldwide affected by NTDs, although ambitious, is achievable, with effective and diligent results-based monitoring. To this end, a fundamental component of the Declaration is the provision of technical support, tools and resources to countries where these diseases are endemic, to evaluate and monitor these programmes. A London Declaration Scorecard has been designed to track outputs from all stakeholders in order to map progress and identify risk areas that need to be prioritized to achieve the 2020 WHO goals for NTD control and elimination. In advance of the first anniversary of the Declaration, a new report, “From Promises to Progress”, was released in London to chart developments over the past 12 months. The results reveal encouraging progress, with over 40 countries delivering detailed plans to control and eliminate NTDs. Drug Supply: Pharmaceutical companies donated more than 1.12 billion treatments to people with NTDs and 29 new countries received free supplies of the drugs, albendazole or mebendazole for the treatment of STH, increasing treatments from 46 million in 2011 to 238 million in 2012. Funding: Some of the highlights of the funding commitments included: DFID increasing spending on NTDs from £15.3 million in 2011 to £26.3 million in 2012, and USAID and the Bill & Melinda Gates Foundation committing US$89 million and US $47 million respectively, in 2012. Research: Eight new pharmaceutical companies provided access to hundreds of thousands of compounds to be screened for potential new drugs and regulatory approval has been granted for two new NTD diagnostic tests. Other promising results can be viewed here. So what lies ahead for the fight towards the eradication of NTDs? Despite the encouraging start, From Promises to Progress has also identified gaps, highlighted by Margaret Chan, “recent progress has revealed unprecedented needs: more nuanced control strategies and new technical tools.” Indeed, an additional $300 million is needed annually through to 2020 for the implementation of the programs. If we are to create sustainable change and address the causes of NTDs, in order to achieve WHO’s 2020 goals, the report claims that the “NTD community must secure the increased resources and political will necessary to initiate and scale up programs to close the remaining gaps.” The political will is there, demonstrated last week in Geneva when the WHO’s Executive Board recommended a resolution on all 17 neglected tropical diseases. However, in order to eradicate NTDs from the modern world, it is critical that this pressure at all levels of society, throughout the international community, is sustained.